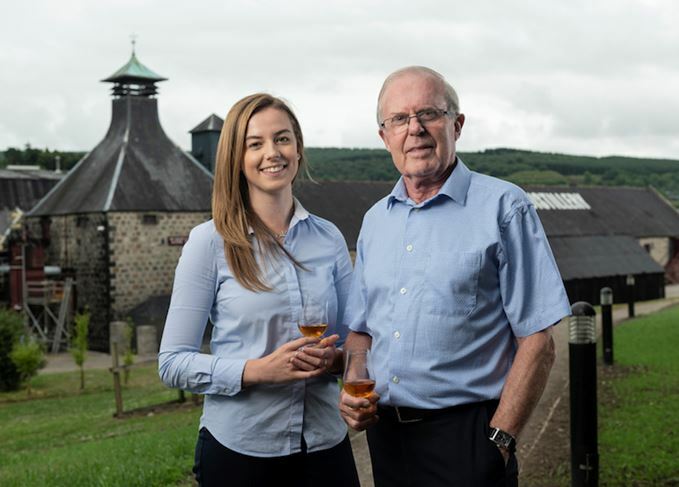 Speyside single malt Balvenie has named 25-year-old Kelsey McKechnie as apprentice malt master and potential successor to Scotch whisky legend David Stewart MBE. Glasgow-born McKechnie will be mentored by Stewart, the longest-serving malt master in Scotch whisky with a total of 56 years’ experience in the industry. She will also be tasked with maintaining ‘excellence and consistency’ in Balvenie’s whisky, ensuring that its spirit is ‘maturing in the desired direction’, and assisting Stewart in launching future expressions of Balvenie. McKechnie, who has a degree in Biology and Biological Sciences from the University of the West of Scotland, has been studying for an MSc in Brewing and Distilling at Heriot-Watt University in Edinburgh, from which she graduates this year. She has also been working with Balvenie owner William Grant & Sons as a technical graduate and whisky technologist, shadowing Stewart in the creation of recent Balvenie launches, including Balvenie Peat Week Aged 14 Years, Balvenie DoubleWood Aged 25 Years and Balvenie Fifty: Marriage 0962. McKechnie has also worked with William Grant master blender and Glenfiddich malt master Brian Kinsman – who was himself mentored by Stewart for eight years – on spirit development for the company’s roster of brands. ‘It’s hard to underplay the significance of this announcement – the appointment to apprentice malt master represents a once-in a lifetime opportunity for anyone working in the whisky industry,’ said Stewart. There is as yet no confirmed timetable for when McKechnie will take over from Stewart as Balvenie’s malt master. Stewart began his career with William Grant at the age of 17 as a whisky stocks clerk in 1962, and is perhaps best-known for his pioneering work in the area of ‘finishing’, or double cask maturation, in the 1980s. He remains malt master at Balvenie, but handed over his broader responsibilities for Glenfiddich and Grant’s to Kinsman in 2009, and was awarded an MBE for services to the Scotch whisky industry in the 2016 New Year’s Honours List.